Hurry, hurry, hurry! Sunday night is the deadline to enter the drawing for a Bisquick Gluten Free prize pack. As part of the loot, the winner gets a box of the new mix and cooking accessories that can be used to make gluten-free pancakes. Just add a comment to the post about what recipe you'd like to prepare with the mix. Silvana Nardone, the former editor-in-chief of Every Day with Rachael Ray magazine, will be signing copies of her new gluten-free and dairy-free cookbook, Cooking for Isaiah, at Appetite for Awareness on October 24. Silvana will also demonstrate and sample some of her recipes there. Don't worry about missing the Eagles game that afternoon: it will be broadcast at the event's Beer Garden, where Bard's beer and Magners and Woodchuck ciders will be served. Discounted early-bird tickets are still available. It is Greek to you? Kuzina by Sofia in Cherry Hill (404 Route 70 West, 856-429-1061) has a number of gluten-free items on its menu. Many of the vegetarian and protein choices are gluten free and other items can be modified. Here's a twist: NaBrasa, a Brazilian steakhouse in Horsham (680 North Easton Road, 215-956-0600) notes which items on the rodizio menu are not gluten free. Quite a few desserts are safe as well. Out in Malvern, Ciabatta Pizza (446 Lancaster Avenue, 610-408-0999) serves gluten-free pizza. Two bars in Philadelphia's University City section offer gluten-free libations. City Tap House (3925 Walnut Street, 215-662-0105) has bottles of Estrella Damm Daura, the Spanish beer that I wrote about a couple months back, while Blarney Stone (3929 Sansom Street, 215-222-5340) has Redbridge. Thanks to reader Ezra B. for the info. On the weighty subject of Irish pubs, Dublin Square in Bordentown (167 Route 130, 609-298-7100) serves Bard's and Magners. A second location is slated to open soon on Evesham Road in Cherry Hill at the former site of Swanky Bubbles. 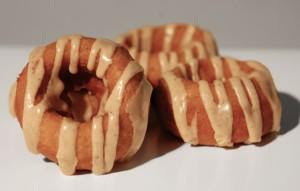 To celebrate the fall season, gluten-free baker Kinnikinnick Foods has launched Pumpkin Spice donuts. Available until November 30 for purchase online, these iced donuts are made with real pumpkin. All donut varieties are 20 percent off until October 8. Kinnikinnick has flat-rate $10 shipping. Notice of a couple events this weekend recently came across the wire. First, Nemours Children’s Celiac Center, in collaboration with the Children’s Celiac Support Group, will host their annual Celiac Disease Conference tomorrow from 9 a.m. to 3 p.m. at Alfred I. duPont Hospital for Children in Wilmington. The event and vendor fair is free and open to all children and families. Call 302-651-5928 extension 1115 or e-mail the support group to RSVP. This Sunday is the date for the Southern New Jersey celiac support group meeting. Psychotherapist Nicole Seitz will address attendees beginning at 2 p.m. at the Barry Brown Health Education Center in Voorhees. I'll leave you this week with a video segment from "Good Morning America" featuring Silvana Nardone and a few of her gluten-free recipes.